The concept of transaction cost, since it was introduced in 1937 by Ronald Coase, has been explored and debated extensively in economics. However, empirical studies on the subject are still limited especially its application to typical transactions, such as housing purchases. High transaction costs are correlated with lower transaction volumes and less transparent deals. If transaction costs are excessively high, the market may cease to exist altogether (see Allen (1999) for a survey of related studies). In real estate, lower transaction costs can stimulate market turnover and enhance the responsiveness of housing markets to macroeconomic stimuli. Rising demand is more likely to have a larger impact on house prices in countries with lower transaction costs (Zhu, 2003). Several studies of real estate transaction costs in Europe have indicated that costs are higher in Southern Europe and lower in England and Scandinavia. These studies have been used extensively by other authors and have yielded several analyses of the behavior of European housing patterns. Using a 2001 study on transaction costs by the European Monetary Federation (EMF), Earley (2004) indicated that in countries where costs are high, more individuals postpone their decision to purchase properties. Co-habitation and extended families are common, leading to congestion and overcrowding. Earley, the EMF’s head of Research and Statistics, concluded that in Europe, countries with higher transaction costs have lower market turnover and bigger household sizes. The same EMF study used by Earley (2004) was published in 2005 as “Study on the Cost of Housing in Europe” by the EMF. It concluded that transaction costs are higher in Southern Europe and lower in the Scandinavian countries and the UK. In the study, transaction costs were found to be highest in Belgium at 17.1% and lowest in the UK, at 1.9%. However, a closer look at the study shows that it covered only 11 European countries, three countries from southern Europe (Greece, Italy, and Spain), three from western Europe (Belgium, France, and Germany), two from eastern Europe (Hungary and Poland) and three from northern Europe (UK, Denmark and Sweden). These findings on the level of transaction costs were confirmed by Belot and Everdeen (2006). They found that average housing transaction costs are highest in Southern European countries particularly Italy (19%), Belgium (18%), and Portugal (15.5%). On the other hand, Anglo-Saxon countries are at the bottom of the scale (New Zealand, 3.5%, UK 4.0%, Australia 4.5%). The study covered 22 OECD countries including 17 European countries (18 including Iceland, but they don’t have transaction cost data for Iceland). This present study expands the existing literature on real estate transaction costs in Europe. Costs incurred in purchase of flats are examined. By including as many European countries as possible, the study wishes to verify if observations made in previous studies on the level of transaction costs in Southern Europe and Scandinavia are true. Transaction costs can be separated, conceptually, into several categories. For instance, North (1997) separates enforcement and measurement cost. Quigley (2002) lists six different types of costs for housing purchases: search cost, legal cost, administrative cost, adjustment cost, financial cost and uncertainty cost. Some of these costs are difficult to quantify while some are very subjective. For the purpose of this research we focus on four major costs: registration costs, real estate agent fees, legal fees, and sales and transfer taxes. In most countries, bulk of the cost is paid by the buyer. From an economic point of view, however, it does not matter who pays the taxes and fees. The actual payer of the cost depends upon the elasticity of demand and supply, or whether it is a seller’s market or a buyer’s market. In a seller’s market, there are more buyers than sellers, the seller has the bargaining power to make the buyer pay all the costs. The costs that must be paid by the seller can be frontloaded on to the selling price. Source: Global Property Guide research with inputs from local real estate agents, government agencies and World Bank Doing Business website. To analyze transaction costs more clearly, a hypothetical case is used where an EU-national purchases a property worth €250,000. To make the case as simple as possible, the property is paid in cash. The unit is a condominium located in a major city. The property was used by the seller as his principal residence for the past ten years. Only official costs are considered. Property and capital gains taxes are not included although they are required to be paid before the property is registered. Fees in acquiring the prerequisites for property purchase such as residency permits and company formation are also not included. Among the 37 European countries in the study, roundtrip transaction costs are highest in Bulgaria and Russia at around 25% of property value. Belgium and Italy, often cited as having the highest costs in Europe, indeed have high transaction costs at 17.88% and 17%, respectively. Total costs are lowest in Estonia, Slovakia, Lithuania and Denmark, below 4%. Transaction costs in the UK are near the bottom at around 5%. With more comprehensive transaction cost figures, we can now see whether transaction costs are indeed highest in southern Europe. Following the UN geo-political grouping for Europe , the average roundtrip transaction cost is highest in Western Europe (13.7%), followed by Eastern Europe (11.6%). Southern Europe comes in third with a 10.7% average transaction cost. Northern Europe has the lowest cost with a mere 5.2% average roundtrip cost. However, there are huge differences in transaction costs within these geographical areas. For instance, the average for Eastern Europe is pushed upward by Bulgaria and Russia. If we remove these two countries, the average cost for Eastern Europe goes down to 7% from 11.6%. From an economic point of view, it is unrealistic to expect that countries that are near to each other will have similar cost structures. There is a possibility that Southern Europe refers to a cultural or legal grouping and not a mere geographic setting. According to the legal origins theory, many aspects of a country’s economic development are the result of the quality of institutions, particularly the legal system (La Porta, et al, 1998; Glaeser and Shleifer, 2002). A country’s legal system affects several aspects of transaction costs in a country including, the system of property registration and the role of lawyers and brokers. Socialist civil law: Bulgaria, Croatia, Czech Republic, Estonia, Hungary, Latvia, Lithuania, Poland, Romania, Russia, Slovenia and Ukraine. Using this delineation, countries with French legal origins, on average, have the highest transaction costs at 14.4%. It is worth noting that most countries in southern Europe have French legal origins. Average transactions costs for French legal origin countries are significantly higher compared to countries with different legal systems, Socialist (10%), English (7.7%), German (7.25%), and Scandinavian (5.9%). Grouping countries in terms of legal origins also reveals institutional differences in property transactions. The services of lawyers are used most widely in French and English legal systems. In several countries with French legal systems the use of lawyers is mandatory with fees set by law. Sales and transfer taxes are also more common in French legal system countries. In countries with English legal systems, conveyancers are not required but are highly recommended. Conveyancers’ fees are generally negotiable. Most countries impose higher costs for new properties. This is viewed as progressive tax measure since it is assumed that richer people and second home-buyers purchase brand-new properties. However, this can lead to adverse effects on the availability of housing and affordability. As richer households move to better and newer housing, households lower in the income hierarchy move to occupy the void they left, a process called the filtering effect. And because of the filtering effect, any policy that makes it difficult or expensive to produce any type of housing restricts the available stock of low-cost housing (Malpezzi and Green, 1996; Quigley and Raphael, 2004). In countries where transaction costs for property purchases are high, people might be expected to be more inclined to rent housing. We test if there is a correlation between transaction cost, owner-occupancy, and household size. Also, high real estate transaction costs are seen to adversely affect labor mobility, and hence, lead to higher unemployment. Using the transaction costs figures previously generated, we can shed some light on European housing patterns. The connection between transaction costs and owner-occupancy has not been explored fully in the past. Earley (2004) suggests that high transaction costs leads to lower market turnover in Southern Europe. “In the South children stay with the family longer and are helped to own a home.” This was seen to lead to higher owner occupancy rate. However, it is equally possible that lower transaction costs make it easier for households to purchase housing units, leading to higher owner-occupancy rates. We use the owner-occupancy figures from 2005 Housing Developments in European Countries (United Nations Economic Commission for Europe (UNECE), 2006), supplemented by data from each country’s statistics department for the latest figures. 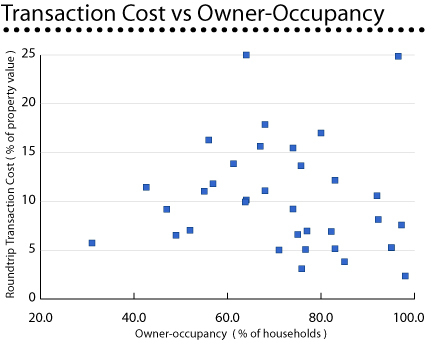 A simple correlation between transaction costs and owner-occupancy rates reveal that there is a slightly negative but insignificant correlation between the two. The inclusion of several former socialist countries in the analysis dramatically changes the picture. Privatization programs in transition countries in Europe led to high owner occupancy rates, while transaction costs in these countries are relatively low or moderate. If we follow Earley’s (2004) argument, we would expect a positive correlation between the household size and transaction costs; households in high transaction costs countries are bigger because of extended families. 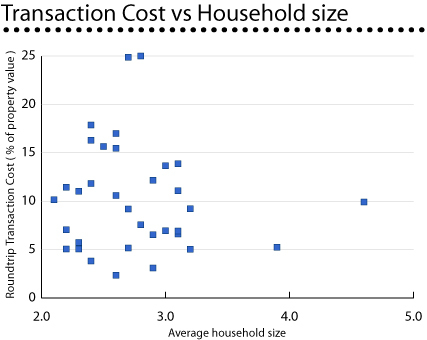 We find a slightly negative but insignificant correlation between household size and transaction costs. This follows from the findings of Fisher and Jaffe (2003) that household size is positively correlated to home ownership, but the correlation is not statistically significant. Several studies have indicated that high transaction costs inherent in homeownership lead to high unemployment rates. Quigley (2002) cites two unpublished papers by A.J. Oswald that pointed to the link between unemployment and homeownership. Because transaction costs are larger for home owners compared to renters, homeowners are less willing to move to areas of job growth when they become unemployed. We use unemployment rates for 2005 from UNECE and International Labor Organization (ILO). Using simple correlation, we find that unemployment rates are positively correlated transaction costs but the results are statistically not significant, similar to the findings of Green and Hendershott (2001). None of these three hypotheses are strongly supported. It is possible that the effects of transaction costs on owner occupation or unemployment works through another variable or channel. For instance, Fisher and Jaffe (2003) found that countries with German legal origins have lower homeownership rates compared to other countries. Further research is needed to explore these issues more deeply. In this study, we compute the amount of transaction costs for real estate transaction in 37 countries in Europe. We find that transaction costs are not highest in Southern Europe, although roundtrip costs in several countries in Southern Europe are quite high. In terms of geo-political grouping, Western Europe has the highest average transaction cost. However, we note that it is unrealistic to expect countries geographically close to each other to have similar cost structure. Grouping countries in terms of legal origins provides a more sensible analysis. 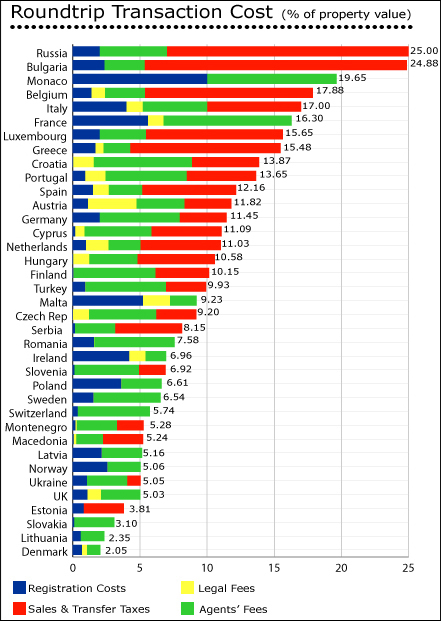 We find that countries with French legal system, most of them in Southern Europe, have the highest transaction cost. Scandinavian countries, on the other hand, have the lowest average transaction cost. Several countries in Europe impose additional taxes on new residential properties. Correlating the transaction cost figures with other variables, we do not find statistical proof on several observations made on European behaviour in relation to housing. Specifically, the correlation between transaction costs and owner-occupancy, household size and unemployment are all not statistically significant. However, more research is needed to confirm these findings. Sig. (2-tailed) .698 .467 .115 .